There’s an untapped market for droid therapists in the Star Wars universe, apparently, as evidenced in R2-D2’s crushing depression—described as “low-power mode” in typical degrading droid terminology—in The Force Awakens. 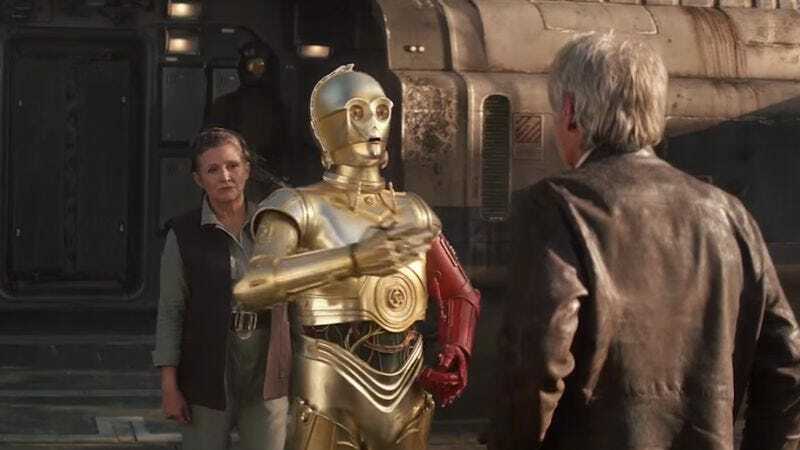 The obvious lack of droid mental health awareness is also seen in C-3PO’s red arm, until now a puzzling but innocuous detail that’s never explained in the film. C-3PO rests his original arm on R2-D2, who could benefit from having someone to talk to besides C-3PO. A one-shot comic called Star Wars: C-3PO #1 (by James Robinson, Tony Harris, and Joe Caramagna) tells the whole horrifying backstory: C-3PO and some fellow Resistance fighters crash-land on a planet with an enemy droid in tow. All the humans—being encased in fragile meat flesh rather than sturdy metal—die, and the rest of the droids are slowly killed off via sludgy oil, spiders, and flying creatures. Only C-3PO and the enemy droid, who’s a bit of a nihilist, remain, wondering what the point of droid existence is, questioning the inhumane way humans treat their droids, and drawing particular attention to their horrifying practice of wiping clean droids’ memories—exactly what happened to C-3PO at the end of the prequels. Anyway, this enemy droid ends up giving C-3PO the crucial information he carries (the whereabouts of where Admiral Ackbar is held in captivity) and steps out into an acid rain to deploy a beacon signal, saving C-3PO and dying in the process. The acid rain burns away his shiny exterior, revealing an original red coat below. C-3PO, already mentally savaged, can’t escape physically unharmed either—he loses an arm in a brutal set of panels, then takes the dead droid’s arm to remember his sacrifice (and maybe because he just needs another arm). C-3PO, haunted by the ghosts of dead droids, will have to work out his issues on his own. C-3PO briefly joins Luke and Anakin Skywalker, who also lost their arms in gruesome ways, as carrying an outward symbol of past traumatic events and inner pain. By the end of The Force Awakens, however, C-3PO is back to normal, at least on the outside. C-3PO stands besides BB-8, a roly-poly symbol of droid innocence, sure to be short-lived now that he’s joined the Star Wars cast.